The high-end resort atmosphere which has made Minocqua a destination for a new generation of northern Illinois denizens has not yet taken root in and around St. Germain, Wisconsin. From Blink Bonnie's Supper Club across the road on Hwy. 70 east, to the Pub and Prime in the town of St. Germain, simplicity and a good value for the hard-earned buck has been the economic rule-of-thumb for recreational pursuits in this beautiful area east of Minocqua. The St. Germain GC is no exception. A municipal golf facility which is owned and operated by the Town of St. Germain, the club sees 25,000 rounds per year; a number which is remarkable in a latitude which is significantly north of what the locals refer to as the "high tension" line. The pace is, in fact, much slower up here and the season is shorter. The first nine holes were built in 1993 and the designer was Gilmore Graves. The popularity of that endeavor encouraged the Town to search for more land. Brian Baldwin is the PGA Professional at St. Germain GC and he was on-site when the second 9 was added in 1996. According to Brian, the additional property was acquired from the Mosinee Paper Company either by trading for or purchasing the necessary acreage and this enabled the Town to expand the facility to 18 holes. Don Stepanik, Jr. was the designer of the "new nine" and the newly acquired acreage was situated in such a way as to dictate a combination of old and new. The "new" holes were 4 through 12 and they were built along the northern extremity of the property. 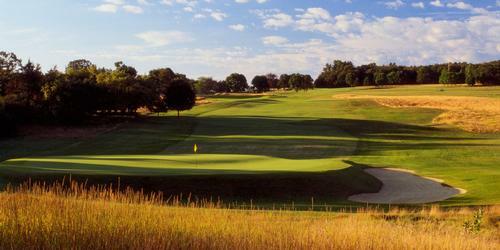 The locals refer to holes # 4 through #7 as the "Amen Corner" of St. Germain GC and the designation is accurate. With lengths of 405, 373, 167 and 384, respectively, each hole offers challenges which force one to think through the strategy required to negotiate the trees and topography which has given incisors to this stretch of golf. Hole #5 is considered to be the club's signature hole, in large part because of the two ponds which come into play off the tee. Their presence squeezes the landing area so that an optimum tee shot must carry the larger pond at 220 yards and hold on an isthmus about 30 yards wide. The second shot is uphill to a contoured green which requires at least one additional club. 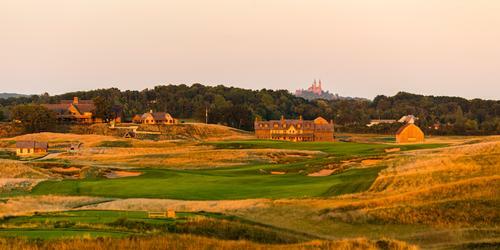 This hole has as much shot value as any hole on the course and is the most dramatic visually. Safely reaching the isthmus and green in regulation is truly exhilarating. Number 7 requires another precise tee shot followed by a second effort to a raised green which has a false front and a ridge running through it which enables a grumpy greenskeeper to put murderous thoughts into even the gentlest psyche. The fairways on many holes are lined with a dense mix of conifers and hardwoods which gives one ample opportunities to seek his/her golf ball and pick up an abundance of orphaned Pro V1s which have been released into the wild. The continued opportunities to thread one's way between the wooded areas can have a wearing effect on one's nerves and when you make the turn and step up to the 10th tee, your relief is short-lived. The expanded fairway stretches to 449 yards; followed by a 206 yard par three to a slightly elevated green and then on to the 588 yard #12 which always seems to be a par 6. The par three 14th thwarts most efforts and wayward shots there are rewarded by double bogey or worse. The double dogleg 18th hole culminates in a semi-blind shot into the green that pushes into the fountained pond which beautifies the area west of the clubhouse. Brian Baldwin's pro shop occupies the back side of the White Tail Inn, the restaurant and bar which serves the golf patrons and the vacationers who travel across Hwy. 70. It is a facility which is constructed of white pine logs which defy any sense of scale that this writer has experienced or imagined. Harvested from an 80 acre plot of virgin timber in the Nicolet National Forest, the logs which were used to construct the White Tail are 30 to 36" in diameter. Jerry Wait of Frontier Builders in Land'o Lakes managed the project from beginning to end and told me this about the origin of the timber and the genesis of the project. "We were contacted by the originators of the project and we went up to Phelps to look at this "80" which, supposedly had a virgin stand of white pine. What we found was an isolated plot of 200 year-old trees which clearly had been untouched. I think because it was so isolated, the loggers didn't want to tackle it because of the difficulty of moving equipment in and out. There weren't any roads in. Anyway, we went in and selected the trees which we needed to accomplish the project. There were no stumps, which would indicate that no cutting had taken place. The loggers took what we needed and we transported the logs to our yard in Land o' Lakes. The trees had been selected for straightness and minimum taper and then grade-stamped. We only used about 5% of that 80 acres. I don't know what happened to the rest of it but I did hear that it was harvested and the land was developed after that. The logs were peeled and sorted at our place. We took about eight months to put it together in our "yard" and after that we took it on trucks to St. Germain. We have a 147' boom in the yard and that's how we handled them. After we got them to St. Germain, it only took a little more than a week because we'd already had it pretty much together. The architects were from Chicago and they were there when we reassembled it." The chandeliers at the White Tail Inn are constructed of hundreds of replicas of trophy antlers from deer which had been harvested in Wisconsin. These are massive constructions which, scalewise, are in keeping with the massive logs which accomplish the necessary height stacked only six high. The fieldstone fireplace is big enough to walk into and the detail of the dcor is vintage north woods. 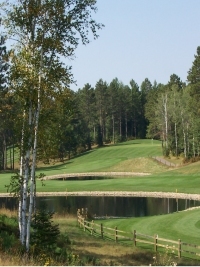 The White Tail Inn offers a tremendous bonus to visiting golfers who are interested in the history and lore of the north and times long past when logging was king; before recreation had become Wisconsin's largest industry. The food is excellent, too. 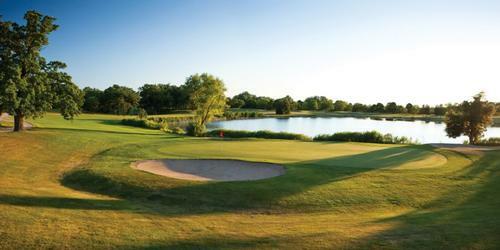 You can reach Brian Baldwin at 715-542-2614 or just key in www.stgermain-golfclub.com. More information regarding the area and the White Tail Inn can be found at www.stgermain.org. John Ehle writes for GolfWisconsin.com, GolfTrips,com and other golf-related sites in the US. He has attended 6 Open Championships in the British Isles and many men's and women's US Opens and PGA Championships as well as Ryder Cups and President's Cups. His primary international writing is golf course reviews and travel articles. He also writes about golf equipment and other golf-related products. Most recently he traveled to Cuba and will be in SE Asia for 6 weeks in February and March, 2012. He writes a weekly column for a metropolitan newspaper in the Milwaukee, Wisconsin area. He is a 10 handicap golfer and has competed in many Wisconsin State Golf Association events. Imperial Stocking Cap - Winter Golf Necessity.